A ban on smoking tobacco in public has come into force in India. Health Minister Anbumani Ramadoss says he aims to cut the number of smokers and to protect passive smokers from the harmful effects of tobacco. The government says India has more than 120 million cigarette smokers. Observers say the ban will need to be strictly enforced. Those flouting it face fines of 200 rupees ($4.50). Tobacco smoking in India kills 900,000 people a year. That figure is expected to rise to a million by 2010. India’s health ministry says hundreds of thousands of people who have never smoked die each year by inhaling smoke from other people’s cigarettes and bidis (small hand-rolled cigarettes common in India). “From 2 October India is going to go smoke-free in all public places,” Mr Ramadoss said. “The aim is to discourage the smokers, to make them quit or reduce smoking. Also all non-smoking employees have a right to a 100% smoke-free atmosphere. Health experts say passive smoking contains more than 4,000 chemicals and exposure can cause lung cancer, heart disease, bronchitis and asthma. In the capital, Delhi, no-smoking notices have been posted at many office buildings, restaurants and hotels. The government has provided an exhaustive list of what it deems to be public spaces as well as officials who have the authority to fine law-breakers. People will still be able to smoke inside their homes, and in open areas. The health minister says he has written to all state governments asking them to ensure the ban is observed. 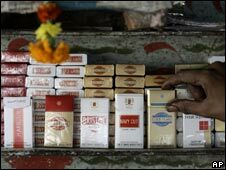 Legislation to outlaw smoking in public in India was first passed in 2003. A ban was supposed to have taken effect in 2004, but it has taken four more years to work out guidelines before it could be implemented. Rodarte’s Kate and Laura Mulleavy at the Bay in Toronto!